Cedar Pine Discount Groceries is another of umpteen little Amish-run food stores tucked away in corners of North America. It’s located in the little community at Roseville, Illinois, a one-church district settlement founded in 2007. Cedar Pine sells bent-n-dent and salvage goods, along with some homemade and fresh products. The Roseville community is a small one, of just 15 families. So non-Amish make up the majority of customers at Cedar Pine. The Amish owners, Catherine and Edwin, have the uncommon surname (at least for Amish people) of “Lee“. Saturday is the store’s big day. They sell fresh doughnuts, offer free coffee and see around 100 customers that day. The Lees rent trees in the area to produce maple syrup. Technology the Lees use: a refrigerated truck with one side cut open; gas lights; fans; solar-powered freezer and cash register. 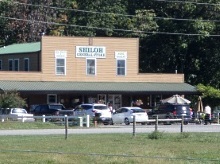 The last Amish food business I visited was the Shiloh General Store in Union Grove, NC. This is not a bent-n-dent but sells canned goods, bakery items, and deli foods. It seems geared to a non-Amish clientele. The place was packed on the Saturday I visited (see photo) and the only Amish people in the place were working there. Cedar Pine and Shiloh General Store are not unusual. 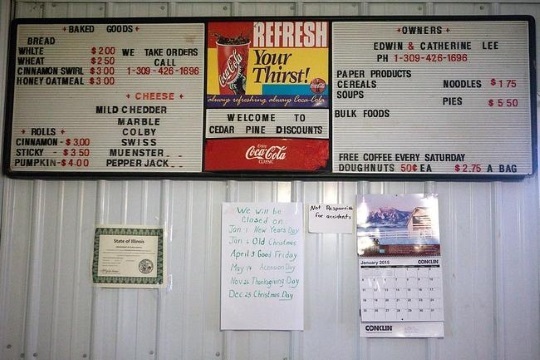 Amish-run food stores often cater to both an English and Amish customer base. BB’s Grocery Outlet (Lebanon, PA) is popular with both English and Amish. Kauffman’s Bulk Foods (Jasper, NY) reportedly has more English customers than Amish. The owner of the new Heritage Hill Country Market (Chatham, VA) plans to target both groups. Have you visited an Amish-run grocery, bulk food, or salvage store? Did you see more Amish or English customers? I’ve been to a number of Amish-run grocery/salvage/bulk food/etc. stores. Very often while visiting a new area these are a place to find out all kinds of information about the community, the particular type of Amish that live there, and/or some of the must-see sights while passing through. For the English visitor, these places can be the best of times…, or the worst of times. In those stores that are eager for English business one typically (at least in my limited experience) finds friendly and engaging folk working there; for those in stricter communities and/or that prefer to only serve their fellow Amish, sometimes they are not so willing to interact with outsiders. But finding that unique little hole-in-the-wall shop or that particularly extroverted Amish shopkeeper — those can make the whole trip worthwhile. I know what you describe as far as an occasional unwelcome-ish feeling, have only felt it a few times but it’s usually going to be in a place with predominantly Amish customers. Once in a store in Big Valley in PA, maybe another time in a smaller community in Ohio. Sometimes it may be compounded by the store clerk being a woman and I am obviously not, which was true in both of these cases. Yes, it is rare, and the particular one that comes to mind at the moment was a younger lady, and I was traveling alone. And besides the gender difference, possibly her being younger and that we were in the store alone, the small store did seem stocked for Amish clientele. And add to this that it was a Swiss Amish group — which means ultra-conservative, right? The young lady was not at all rude, but was a bit stand-off-ish and business-like. But I took no offense at it, of course. I wouldn’t call them ultra conservative as there are plainer Swiss and less-plain (comparing material conditions between Allen and parts of Adams County for example) and they all at least use the SMV triangle. In my experience Swiss Amish are generally more closed to outsiders. On the other hand one of the friendliest and most open Amish storekeepers I’ve spoken with was in a small Swiss community in NE Indiana. Generally female storekeepers I’ve found are more matter of fact and less apt to get into a conversation with me as an outsider and a male, than men. Nice description Terry. I wonder how many come for the food vs. the prices vs. the “experience”. We have a bulk food store about 15 minutes from us, but what fun it that…to just go and buy what you need and come home? We save $ at that store, but it’s just not the same “experience” as traveling the back roads in rural Wisconsin, heading to Amish country, and spending the whole day having old fashioned fun! The end of April-late Oct there is a small town on the way to the back roads that has a flea market every Sat. So, that’s our first stop, and we go “junkin.” We head south of town,stop for lunch, and then off to go Amishing! First stop; bakery. Second; Mishler’s bulk food store. Third; furniture store. Fourth: Katie’s rug and dry goods shop. Fifth; another furniture store just to browse. Sixth; stop in to say hi to the gentleman that I bought my cook stove from, and buy eggs. Seventh; our good Amish friends who I wrote and informed them when we’d be stopping, so there’s a treat to go with our conversation! If we go in May there are several green houses to check out as well. By the time we head for home we’re loaded with treasures of all kinds! One of the treasures is to just enjoy the whole back road experience and the slower pace that is offered. When we are getting close to home we get back on the 6 lane highway, and have returned to the rat race of city life. Terry, a great reason to make a day of it. Your trips do sound like a lot of fun. One of these days I will make it to Wisconsin again (I lived there a summer, but before I knew much about the Amish). Where is Wisc did you live? Give a call when you’re in the state, and we’ll have a warm meal and bed for you! Then we’ll all go Amishing! 🙂 ps: We’re in the Fox Cities if you know where that is. Appleton and surrounding area communities. Is there "Amishing" in North Carolina? I moved from Georgetown, KY to live in Brevard, NC,near Asheville. Where are the closest Amish communities? I used to get my eggs down the road west of Mishler’s and fresh produce west of there too. There is another house nearby that sells homemade chocolates,pies and deserts and it is all on one or two tables with the prices on them with a money drop box at the end. Hey Jeff, where do you live? We’re in Neenah, and Princeton is the town that has the flea market. I listed most of our stops on my post, but then there are always more to check out, and if we don’t purchase anything we still have a chance to visit with the family or kids that are selling their wares. I live in St Petersburg,Florida Now. Hey Terri – I live in St Petersburg,Florida Now. I am about 45 minutes north of Pinecraft(Sarasota), Florida. I also miss the good fishing in your area. I used to fish mostly the wolf/fox and rat rivers from Omro to north of Fremont. People are more friendly in Wisconsin than Florida -the warm weather is the draw to living in south Florida. Salt water fishing is fun too. When I get back to the Dalton area(hopefully this summer)I will stock up on dry goods and seasonings. Food prices in Florida are about 1/3 higher than up north. Indiana, I went to E and S in Shipshewana. It is a very large store which I’ve seen really grow in the past 25 years. It is a “combination” store with lots of bulk food, produce, bakery, and salvage food items. Not so much bent and dent, but more like overstock, and out of date items. I went on a Sat. morning and there were at least 100 people in the store -about 40% Amish and 60% non-Amish. It is Amish-run, but is one of the most modern Amish stores I’ve been to.It is interesting to hear announcements on the loud speaker such as “Bagger Number 4 please come up front.” In Dec. I went to the country discount salvage store at Rosebud/Salem, Indiana. I was the only customer. In previous visits, I would say that customers are about 10% Amish and 90% non-Amish. I always enjoy my visits there because I’ve had some very interesting conversations with the proprietors of the store. My favorite stores to visit: The first is Miller’s Health Food Store in the Leola area of Lancaster County. Miller’s is tucked at the back end of a farmstead and farmlane. The second is Echo Hill Farms in Dryville, just outside Kutztown, Pennsylvania. Echo Hill is conservative Mennonite operated with a wide variety of bulk foods, organics and other items. If anyone is in the area, look them up you won’t be disappointed!! That’s good to know. I have relatives in Allentown, Emmaus, and Macungie — not too far from Kutztown. You do a really great job covering a diverse genre of Amish lifestyle, values related and cultural topics and venues. Every read is a pleasure! You must check out the Stringtown Grocery just outside Kalona, Iowa. Skylights, gas lights, four aisles, bulk flours, cereal, pastas, and all sorts of unimaginable goodies. Central Discount, the ‘bent and dent’, is just up the street. Hi Everyone, I live in the Southern Tier of New York about an hour North of Scranton in Binghamton. Lancaster Co. and it’s vicinity is about three hours away. I have gone to “Am Land” (my family’s reference to Amish County) so many times that I have a circuit that I travel. My stops for discount groceries include: Hornings in Bethel and Myerstown; B & B in Shaferstown, Morgantown and Quarryville; Green Hills in Lititz; Glenwood Foods in Hinkletown; Creekside Bulk Foods near Gap; Buy Rite Liquidators in Blandon; and Echo Hill Bulk in Blandon. My favorite thrift stores are: Reuzit in New Holland and Ephrata and Goodwill in the middle of a farm field in East Earl. My regular buffets are Yoder’s in New Holland and Dutch Way in Myerstown and Gap. In the spring I do a run for plants that include numerous greenhouses. As a previous writer stated, Miller’s Health Foods on a farm in Bird In Hand is a real treat to see. I really love the picturesque and serene countryside there. The Amish are meticulous in the upkeep of their properties. It is apparent that they are very prosperous in their cottage industries by the size of their farms. A trip once a month for me affirms that you don’t have to live on the grid in order to be successful in the modern age. I think that their resourcefulness and simplicity are very enviable traits. It is refreshing that they have all they need without participating in society’s commercial driven economy. I visit several markets in my area. My favorite is an Old Order Mennonite orchard/farm market called “Wispering Pines” in Mt Pleasant Mills, Pa. Here is all about orchard fruit and anything you can make from it. They have an amazing bakery and it’s common to hear the women sing church songs while they bake. These are the sweetest people I’ve ever met and while I don’t understand every word they speak to me, I know they are the real deal. The shoppers are about 50/50 OO and local English. The targeted customer is certainly the local folks but many English can fill there needs by shopping here. The owners buy fresh veggies at the two local major auctions and offer those goods at great prices. They also buy from local farmers so you get the freshest produce at prices only slightly higher than the local farm stands. Sometimes you can even buy a puppy or two outside for 35.00. Almost all of the puppies are mixed blue cattle dog ones that are so cute. I haven’t done that yet but I would not hesitate to do so if I wanted a puppy. They also bulk numerous items and the price can not be beat. A few miles north on Route 104, just outside if Middleburg, you find R&S outlet. Located at the base of Shade Mountain Winery, R&S has everything you could want. Surplus, bulk, bent and dent, the worlds best made to order subs and fantastic prices on produce are the high lites here. The customer base is 20% Amish and 80% English. They do an amazing amount of sales and the inventory is constantly changing. A few more miles up into Mifflinburg is a monster outlet store that is about the size of a small Walmart. They do amazing numbers as the place is always packed. Sometimes the shelves are very bare but the next week there are bargins everywhere and the store is fully stocked. A few miles away is a remote farm store called “the Pallet Store”. The items are bulked out onto pallets and this place would make Cosco green with envy. The prices are crazy low. I also hit three other OO stores in Centra PA and they all offer hit or miss bargins. Bottom line is that I love the deals and I love mixing with the locals who are so much nicer than the rat race stuck-up, plastic over-priced Wegmans/Cosco crowd that I must deal with if shop locally. Judyin, I don’t know if Kalona, IA is within driving distance, but I was there last winter and it’s worth a visit. I’m afraid the stores were closed on the day that I try to visit them, but I’ve heard several comment (and maybe even someone on this thread) about them. There is also a cheese manufacturer (not Amish) in the area that is worthy of a stop. Be sure to try their curds. Judy, I think I may be of help. I grew up near the Ia/Mn border and have been to the plant/produce auction south of Riceville, Ia. many times. The Old Order Mennonite (horse and buggy type) community there has several schools, as well as two very interesting stores — Sunnydale Dry Goods and Dutch Valley Grocery. Even though Dutch Valley is Old Order Menn, it very much has the “feel” of an Amish bulk food store. I was in the St. Charles/Utica, Mn. Amish community a couple of years ago and I went to an Amish Bent’N Dent grocery that had just opened. Sorry I don’t have the exact address, but you could ask at the Amish produce auction and I’m sure someone would have the directions. (not the one at Riceville/Elma) about directions to the Bent’N Dent store near St. Charles. I live in Massachusetts, and don’t think there are any Amish in our State, is there any online Amish shops? I live in RI and there isn’ t any amish stores here or nearby. I read lots of amish books and novels and from what I ‘ve learned it would be wonderful to visit some of their stores and shops. Maybe someday I’ll get that chance. We like to visit Clare, MI where they have an Amish Bakery, General Store, and Surrey Rd. Discount Foods. We make it a day trip as it’s only about 45 miles north of us. My friend and I are avid Amish book readers.